The court cited, perhaps for the first time in a reported case, the Standards of Courtesy and Decorum for the State of Wisconsin, found in SCR 20:3.3, in its criticism of the lawyer’s conduct. In a footnote, the court noted that usual convention is to refer to contentions as those of the litigant. In this case, however, the court stated that it was deviating from this convention and referring to the allegations as those of counsel, due in part to counsel having personalized the issues before the court. All of us family law attorneys are well acquainted with the issue of transference of anger. After all, we are sometimes the victims. 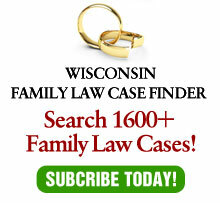 The high rate of malpractice claims and ethical grievances in family law are, no doubt, directly related to clients transferring anger from their spouses to their attorneys. It is where the lawyer adopts the transference and makes the anger his or her own that leads to a lack of civility and professionalism. In doing so, the lawyer does him or herself, the client, and the system of justice, no favors. Several years ago, I received an angry call from a lawyer who was representing the husband in a divorce. The lawyer, who had recently been divorced himself, was highly irate that my client was requesting maintenance from his client. According to the lawyer, my client was lazy and avaricious. And those were the nicer terms he used. After letting the lawyer rant for a while, I told him that it appeared that we had a misunderstanding. “We are asking that your client pay maintenance,” I told him, “not you personally.” The next day the lawyer called me and apologized. We ended up resolving the case. Lawyers in this highly acrimonious field need to walk a narrow tightrope. We need to acknowledge our client’s anger, but not legitimize it. We need to be empathetic, without being sucked into a personal vendetta. Lawyers who fail to walk this tightrope fail to help their clients. On the one side, the clients need to believe that their lawyers are treating them as more than just a fee. On the other side, offering an objective point of view is a valuable service to the clients – perhaps the most important service lawyers can provide. To be sure, many clients do not understand this, at least at the outset. Have you ever been asked by a client: “Are you on my side?” To be “on their side” does not require being obnoxious – or even uncivil. What it does mean, however, is to battle a wide-spread perception of what lawyers do and how they do it. On television, lawyers advocate for clients very differently than we do in real life. We don’t have writers and don’t have sound bites. Explain to each client at the beginning of the representation what you are doing and why you are doing it. Explain why the public perception is wrong and that uncivil behavior only increases the clients’ fees while creating no benefit. Get to know the other lawyer. Meet with him/her and establish a rapport that neither will allow their client’s anger to destroy. If things get heated with the other lawyer, take a “time-out.” It works for a two-year-old. It can work for lawyers who are acting like two-year-olds. Remember that after the divorce, the parties will continue in each other’s lives if they have children. Resolve to do nothing during the divorce process to destroy any chance of their being together for graduations, weddings, grandchildren and much, much more. Choose your clients carefully. If a potent client insists on treating the divorce like a gladiator contest, just say no! Remember that you are a professional. Act like one. This month, the State Bar mid-winter convention at the Midwest Express Center in Milwaukee will be a joint conference with the Annual Judicial Conference. On Wednesday, January 26, a program will be presented entitled “Civility: Are We the Problem or Are We the Solution?” In this program, lawyers and judges will present scenarios and discuss the issues of civility in family law. Please come and share your ideas on how together we can prove that the conduct in the Mogged case is an anomaly. This article originally appeared in Wisconsin Opinions.